There is no universal set of rules, standards, or expectations when it comes to ethical behaviour. There might be legal rules, either in common law or statutory provisions in a public organisation's governing legislation. They have to be followed first. Complying with the law is critical and overrides any other scope for discretionary judgement. Secondly, there might be a relevant policy that would cover the situation, or the public organisation's code of conduct might have guidance or expectations about managing conflicts of interest. Thirdly, if no relevant legal requirement or policy applies (or after any such rule has been complied with), there might be codes of practice for the profession that people work in - such as an ethical code for legal staff, or for accountants. After all of those, people need to consider whether anything else needs to be done. In exercising this judgement, people need to assess carefully the seriousness of the conflict of interest and the range of possible mitigation options. It's rare for a conflict of interest to be so significant that the last two options are necessary. 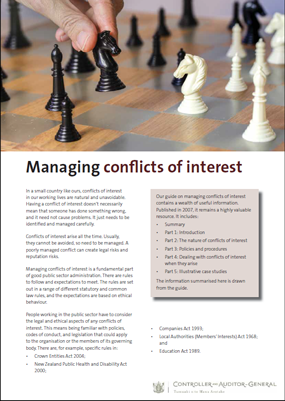 The most common response to a conflict of interest is to stay out of meetings or discussions on the matter (points 5-7 in the list above). For more information, please read Part 4 of our good practice guide.